George Osborne has dropped London from the Evening Standard's masthead, introduced colour-coded sections, turned the business pages back to pink, and added emojis to the weather. Osborne, who claimed the Evening Standard has bucked the print advertising slump by increasing its volume and share of ad revenue in the last six months, said he had drawn inspiration from its 190-year history while aiming for a more "modern" look that is "in touch" with how London is changing. "We’re taking strong elements of the Standard and turning up the volume," Osborne said as he unveiled the first edition of the new-look print edition and the website. 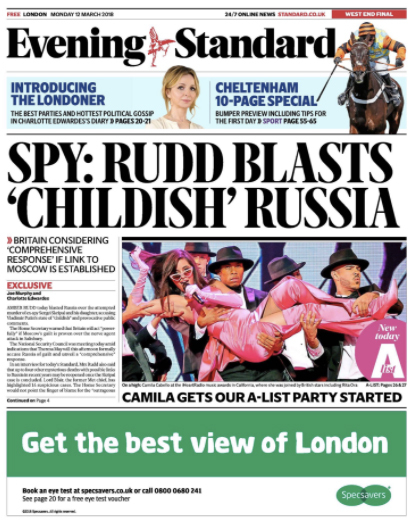 Today’s front page carried the headline, "Spy: Rudd blasts ‘childish’ Russia’," based on the paper’s interview with Home Secretary Amber Rudd about the poisoning of former spy Sergei Skripal – with an ad from Specsavers along the bottom. Osborne said he ditched London from the masthead, after "extensive research" among readers who thought the paper was called the Evening Standard, rather than the London Evening Standard, although he maintained the paper was not taking its focus away from the capital. "We want to speak both to London but also for London on the national and international stage," he said, adding there is a "gap in the market" both in the capital and beyond for an "internationalist, pro-business, socially progressive" outlook as Britain prepares for Brexit. The former Chancellor of the Exchequer, who became editor in May 2017, has made a number of cosmetic changes, including turning the paper’s famous Eros logo back to red and making it more prominent on the front page "to reflect that Eros is at the heart of the city" – in Piccadilly Circus – "and so are we". A briefing to advertisers says the two "puff boxes" on the front page below the masthead can be used to promote commercial partnerships as well as editorial features. There is a new typeface, called Standard, which is "cleaner" and has been designed by Henrik Kubel, who previously worked on designs for the New York Times and Wallpaper*. Osborne has also introduced more colourful "sign-posting" for different sections such as news, comment and business because it has not been "easy" to find them inside the paper previously. There are several editorial changes. Charlotte Edwardes is editing the diary column The Londoner, Clodagh McKenna is writing a new cookery column and Kipper Williams is drawing a cartoon strip on London life. Osborne promised "more interaction between the print and the website". For example, a print reader can look at one of McKenna’s recipes and then go online to watch a video. Asked if he is a much of a cook, Osborne said: "I am actually." Osborne (pictured above) added there was "nothing big" that he had dropped from the paper, although he has cleaned up page two which was "a jumble" with an "out-dated" international weather section. Emojis in a new-look weather section will "describe what we feel about the weather", he said. Today's forecast included the "poo" emoji to describe heavy rain later this week. Several changes are a return to the Standard’s past. The business pages have a pink wash – although they won’t be printed on pink Financial Times-style paper, as was the case more than a decade ago – and Osborne is beefing up the travel section to three pages, which "I think advertisers will much appreciate". The paper’s has dropped its yellow, black and grey colour scheme for some of its branding in favour of red and white. Distribution staff on the streets of London will also wear a new red and white uniform. Osborne insisted the print redesign remains important despite the shift to mobile and online consumption. "We’ve still got a very successful print product," Osborne said. "We’ve got more readers than we’ve ever have had in our history. "Our audited Nieslen advertising figures for the last six months show advertising revenues up by over one per cent against a market where many have suffered 10% drops and our share of the newspaper advertising market is up by close to 3%. "So we’re doing pretty well still at drawing in advertising and working with advertisers on things like sponsorship deals and alike. "We’re not in the mood to abandon that – so long as the print product stays relevant and fresh and looks modern and at the same time bring on the website. "All the substantial investment in ESI [the parent company] is going into the website. The redesign has been done in-house. We’ve not wasted large sums of money on it." Osborne declined to comment on whether the Evening Standard remains profitable, after reporting a pre-tax profit of £517,000 on flat sales of £71m in its last accounts for the year to October 2016. "I can’t give you an interim running on it," he said, ahead of the publication of its next results, "but I think people will be pleasantly surprised at the growth in ad revenues and a growth in market share against a market where almost every other publication that I know of has seen a fall." Jon O’Donnell, managing director of ESI Commercial, added: "We’re confident that brands and marketers will see the benefit of the updates and continue to see great value in connecting to this engaged audience."